Designed by London-based Brand Nu, a.k.a. 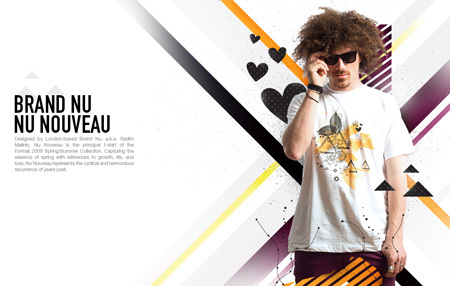 Radim Malinic, Nu Nouveau is the principal t-shirt of the Format 2009 Spring/Summer Collection. Capturing the essence of spring with references to growth, life, and love, Nu Nouveau represents the cyclical and harmonious recurrence of years past. Limited to 300 pieces worldwide. $35.00 – Taxes and S/H included. All prices in USD. Format: Please discuss your inspirations, references, process, and final design for your inclusion in the Nu Nouveau collection. Brand Nu: Sometimes you haven’t got too much time to ponder or sit around thinking where’s to start. I was very chuffed to be included in the selection for Nu Nouveau and started to craft at first available five minutes. I knew I wanted to achieve an element amalgamation of the era alongside my signature style that I’m recognized for out there. The outcome is a display of pure spontaneous idea. Format: Format asked all of the designers of Nu Nouveau to use Art Nouveau as a reference. What art/cultural movements generally inspire your work? Brand Nu: There’s isn’t a certain movement that would solely inspire me. The nature of my work seems quite diverse as is the nature of inspiration that knocks me on my nose. Though I’d need to admit, Art Nouveau aesthetics and structure has made a long lasting impression on my work. I sometimes just dip in and out to remind myself how great art era that time was. Format: Are t-shirts actually a canvas or are we getting a bit too stoosh? Brand Nu: I wouldn’t think it’s a pretentious opinion at all. Any medium that you cover / use for your work serves as a canvas, the bearer of the artwork. At least, I see it that way. It’s then a question of whether the work is art or just design. Format: How, if at all, do you work differently when designing for a t-shirt compared to other media? Brand Nu: I treated the Nu Nouveau idea as any other design work I do, although I was conscious about the number of colours in the final piece. Unlike the norm, I tried to use photographic elements in order to achieve different result to normal vector graphics. Designing t-shirts has changed rapidly in the last few years with arrival of new printing techniques. Let’s say a whole new dimension has opened recently with dye-sub technology. Format: What else are you up to at the moment that people should be aware of? Brand Nu: Unfortunately I can’t give out too much detail on the client names, but I’m yet again privileged to work with some great names in the advertising world. The work right now is beautifully diverse, as I’ve got a good handful of new work awaiting to be started. Also I’m in the process of launching new website for www.brandnu.co.uk. The site is utilising some new style search facility along with a dozen of new commission finished pieces for some household brand names from early part of this year. There will also be new self initiated work and in-depth case studies along with new merchandise to own. The relaunch is planned to 01.06.2009, pencil me in.